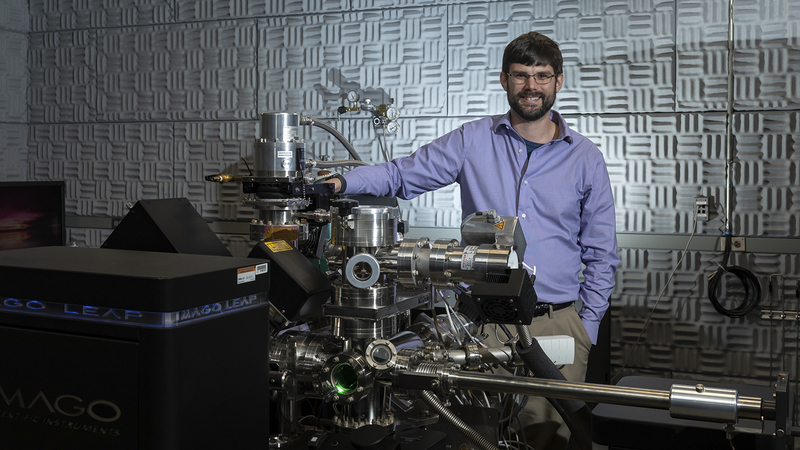 January 24, 2019 – Jon Poplawsky, a materials scientist at the Department of Energy’s Oak Ridge National Laboratory, develops and links advanced characterization techniques that improve our ability to see and understand atomic-scale features of diverse materials for energy and information technologies. His forte is atom probe tomography (APT), a method that can identify the three-dimensional (3D) positions and species of atoms within a volume of material with sub-nanometer resolution. The atom probe pulls atoms off the tip of a needle-shaped sample, atom by atom. When the experiment is done, the material is consumed. The identity of each atom is determined from time-of-flight mass spectrometry as the atom travels from the tip of the needle to the detector for mapping. While APT cannot always extract atom-level structural information, it gives a general 3D picture of the distribution and identities of individual atoms. Poplawsky has used this precise, accurate instrument to characterize zeolite catalysts, solar cells, light-emitting diodes, structural materials, battery materials, semiconductor devices, ceramics and other diverse materials. His nonwork interests are equally diverse. He enjoys rafting and hiking with his wife, Lisa Connor, an assistant professor of child and family studies. He is an avid golfer and ice hockey enthusiast. Growing up in a small town in Pennsylvania, Poplawsky was inspired to pursue a career in science by a high-school physics teacher and went on to earn a bachelor’s degree from the University of Scranton and a doctorate from Lehigh University, both in physics. His research focus in graduate school was cathodoluminescence—using electron microscopy to excite a sample, causing it to emit light. In 2011, while a graduate student, Poplawsky attended a conference and presented results obtained using a one-of-a-kind instrument he had built to excite a sample with a laser and an electron beam simultaneously. The work impressed ORNL scientists, who later offered Poplawsky a postdoctoral position. Arriving at ORNL in 2012, Poplawsky immersed himself in different electron microscopy techniques, most notably electron beam–induced current, which he mastered to study thin-film solar cells. Many years ago, researchers showed that a cadmium chloride treatment dramatically increased the power conversion efficiency of cadmium telluride–based solar cells. A subsequent ORNL study revealed chlorine segregation in the boundaries between structural domains in the film called “grains.” “We found that the chlorine infiltrated the grain boundaries, making it easier for electrons to create an external current to generate power,” Poplawsky said. After Poplawsky delivered a talk at ORNL’s Center for Nanophase Materials Sciences (CNMS), a DOE Office of Science User Facility, Microscopy Group leader Karren More told him she was looking for someone to expand the scope of its atom probe facilities toward exploring nanomaterials. Under the guidance of ORNL Corporate Fellow Mike Miller [now retired], Poplawsky developed methodologies aimed at studying materials that had previously not been studied by APT. An initial new material for APT studies was a selenium-alloyed cadmium telluride that is used in commercial solar films. Poplawsky and others at ORNL identified the structure responsible for its photoactive properties. Recently, Poplawsky has been collaborating on a project led by ORNL’s Amit Shyam that combines the atom probe, electron microscopy and supercomputing to characterize “superalloys” that allow engines to operate at higher temperatures. Poplawsky helped identify the basis for stability of an alloy made of aluminum, copper, manganese and zirconium. On another project led by ORNL’s Ying Yang, he elucidated the atomistic mechanism behind the high performance of a new iron-based superalloy. As part of a CNMS user project with researchers from Utrecht University, Poplawsky used APT to explain the performance loss experienced by a zeolite catalyst and the stability of another zeolite catalyst for reducing diesel emissions. For another project with these same researchers, APT was used to discover that small carbon clusters form near aluminum atoms, clogging a catalyst important to the petroleum industry. Poplawsky has also used APT to characterize materials for the semiconductor industry. No other technique can be used to analyze low levels of impurities in devices with the resolution of APT, because APT measurements are as precise as 1 angstrom and as sensitive as 10 parts per million. The technique will be used to advance understanding of quantum materials—an increasingly important research direction for ORNL. ORNL’s Laboratory Directed Research and Development program and DOE’s Office of Science support Poplawsky’s research.